I’m jumping in with joy. It’s the Feast of Theophany! How can I not post something on this day when there is blessing abounding to the degree that people want to jump into icy waters over it? I am caught between the impulse to spread the riches around, and the awareness of the extreme limitations of my mind when the meaning of Christ’s baptism is set before me. There is a lot to take in and try to absorb at Theophany, regarding the Baptism of Our Lord. St. John himself does not seem to understand the purpose of Christ’s Baptism. He is told that “whomever you see the Holy Spirit rest upon and remain” is the Messiah – but he is given little information beyond that. Witnessing Christ’s Baptism and the Spirit resting upon Him, he hears the voice, “This is my beloved Son in whom I am well pleased” (Matthew, Mark and Luke all bear witness to the voice). 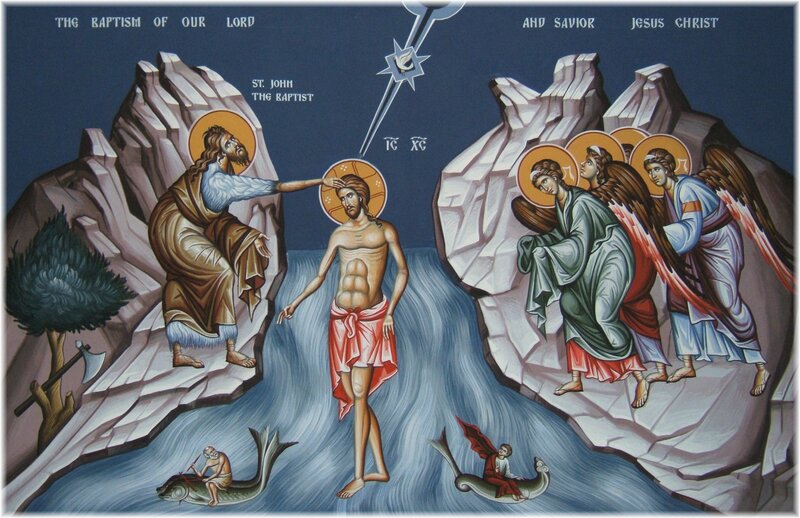 The Church later celebrates this manifestation of the Trinity (Christ in the water, the Spirit descending, the Voice of the Father – hence the title “Theophany”). But with the text alone, on its literal level, we are left with a mystery, without context or meaning. The Tradition of the Church, however, sees the Baptism of Christ in the context of Pascha (Easter) as it sees everything in the context of Christ’s Pascha. Christ’s Baptism is a foreshadowing (and on more than a literary level) of His crucifixion and descent into Hades (just as our own Baptism is seen by St. Paul as a Baptism into Christ’s “death and resurrection”). Allegory is a way of entering the ‘margin of silence’ that surrounds the articulate message of the Scriptures, it is a way of glimpsing the living depths of tradition from the perspective of the letter of the Scriptures. How could we not be welcoming of that? I won’t be jumping into any frozen streams, I hope ever, but I will certainly have the joy of the feast.